Ruling coalition partner Jumhooree Party (JP), on Sunday, announced that it would contest for eight additional constituencies in the upcoming parliamentary election slated for April 6. 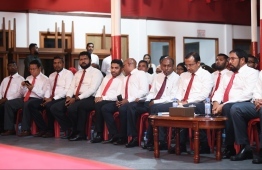 At a meeting held at JP's main hub 'Kunooz', the party's leader Qasim Ibrahim finalised the candidates who would run for the eight constituencies on behalf of JP. The new constituencies for which JP will run are Ihavandhoo, Nolhivaran, Milandhoo, Holhudhoo, Naifaru, Kinbidhoo, Madaveli and Meedhoo. The coalition party previously announced plans to contest in 36 constituencies. In addition to this, Qasim has also revealed plans to contest for two or three extra seats. JP has currently awarded electoral tickets to 44 individuals. The Elections Commission (EC) set the deadline to submit candidacy applications on February 21. Qasim, who is also the Parliament Speaker, spoke regarding the changeable nature of the Maldivian politics. Despite this, Qasim guaranteed that electoral tickets which had already been granted would not be revoked. According to Qasim, favoured candidates who are likely to garner more votes would be given priority over longtime JP members. Meanwhile, former Youth Minister Iruthisham Adam and former Deputy Commissioner of Police, Abdulla Nawaz recently joined JP and will be contesting for the constituencies of South Henveiru and Galolhu South Constituency respectively. JP has awarded electoral tickets to all members involved in the party's leadership and current JP parliamentarians, with the exception of Dhihdhoo MP Abdul Latheef Mohamed and Faresmaathodhaa MP Hussain Mohamed Latheef.